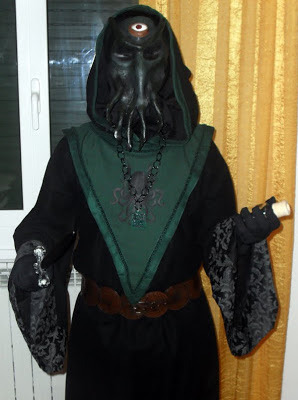 Kronos the Mad brings us this stylish ensemble, a Cthulhu cultist costume. The quality of the fabric, particularly the sleeves, gives it the feel of real vestments. 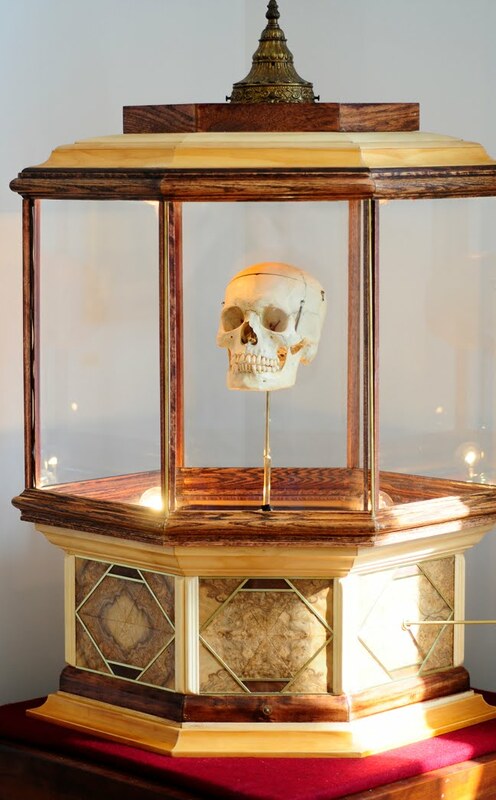 Artist Jeremy Johnson brings us this spectacular crank-driven skull display. The hand-crafted hexagonal case features matched veneers of burled Olive Ash. Another nice piece from artist Stuart Williams. 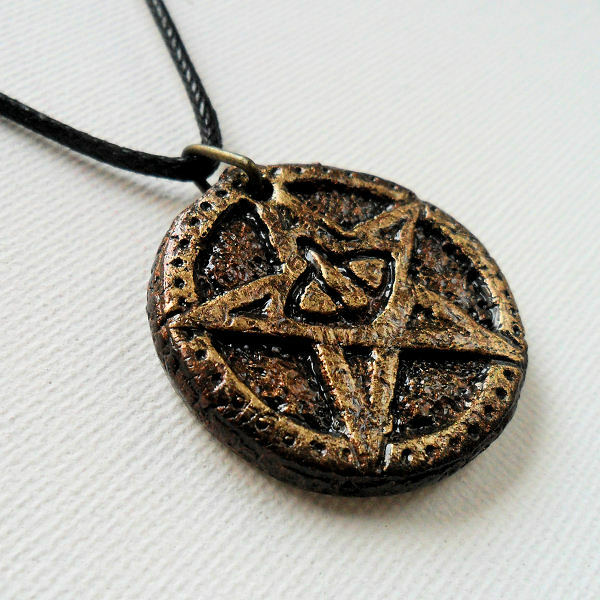 This time he brings us an Elder Sign amulet. 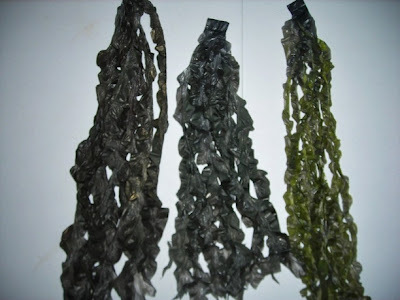 Myke124 brings us this tutorial on making faux sea weed with trash bags and some paint. The end results are perfect for a bit of that decayed seaside Innsmouth look. 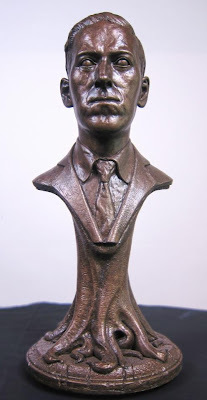 Artist Lee Joyner brings us this excellent bust of H. P. Lovecraft. 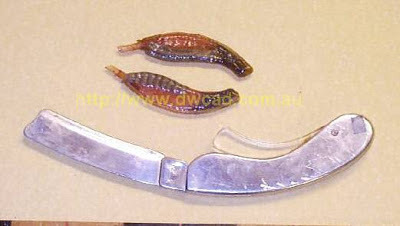 DecoWorks, an Australian prop company, brings us this tutorial on making latex bladders. Wait. I know the natural reaction to that dry description is a big ol' "Meh", but this is a really useful bit of old school propmaking. 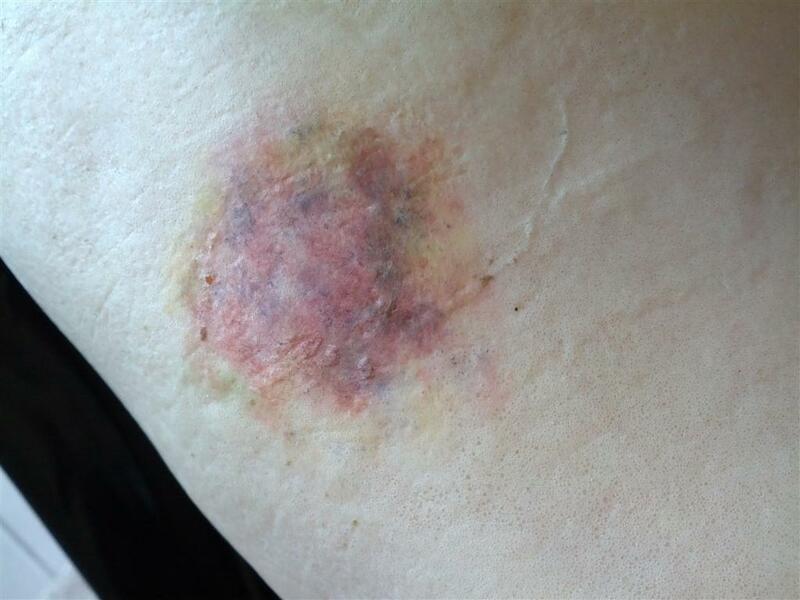 Few things compare with leaving a bleeding wound when you cut someone with a prop knife. It produces an instant visceral reaction, and latex bladders make it possible. Harrison Krix once again brings the world of Skyrim to life, this time with a beautiful steel axe. The final product is an amazing piece of work, but he also details each and every step in sculpting the original master and then casting the parts with resin. 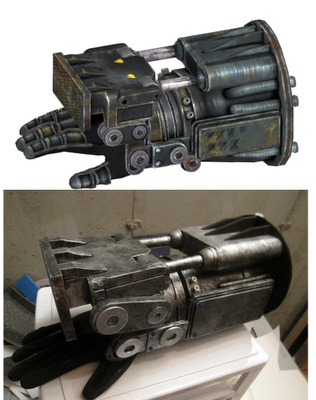 Reading through the whole process is effectively a master class in prop creation. Men in Black. No, Really. As a collector of fantasy fonts for prop use I'm always on the prowl for interesting new typefaces. 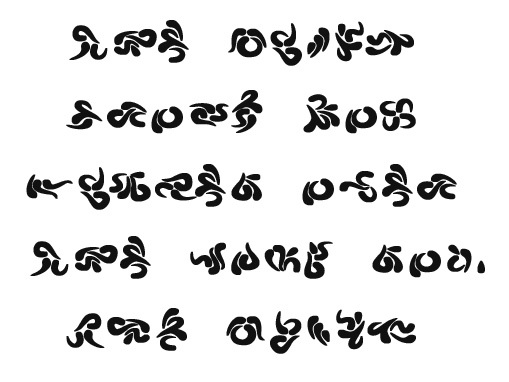 This is a great little font I stumbled across yesterday, even though it's been around for over a decade. 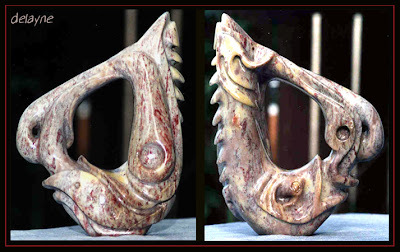 I found it using an image search and thought it had a wonderfully flowing, alien look to it. Imagine my surprise to discover the font is based on the lettering used by Burger King for "Men in Black II" toy meals. 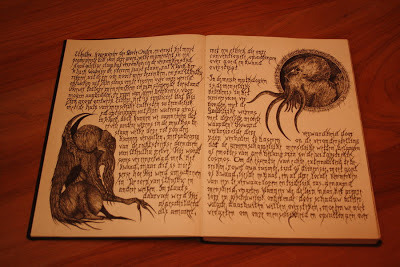 Despite it's amusing origins it has a unique look and a complete glyph set that make it ideal for eldritch text. Sculptor Delayne Corbett brings us this wonderful piece. 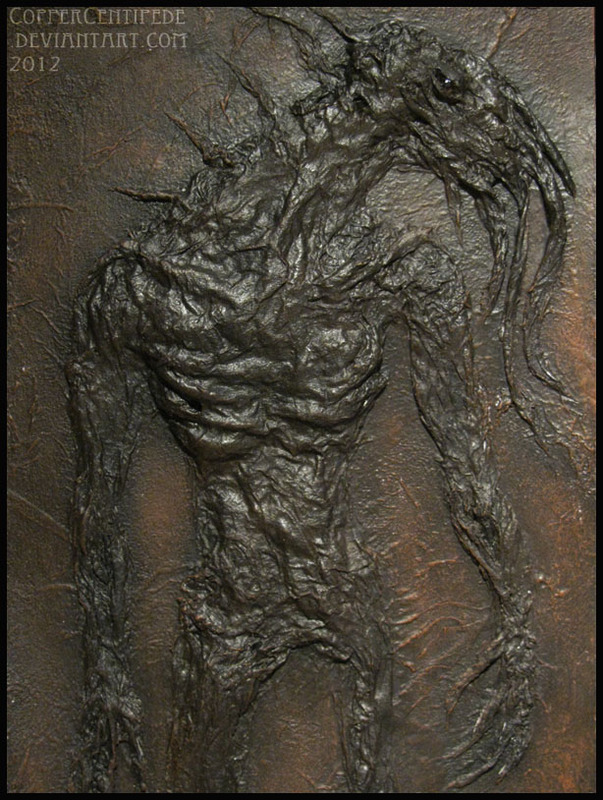 He didn't intend any Mythos connection, but this is exactly the kind of flowing, semi-organic style I see the Deep Ones using. I always feel a bit guilty posting serious art like this because the artist intended it to be appreciated on its own terms. 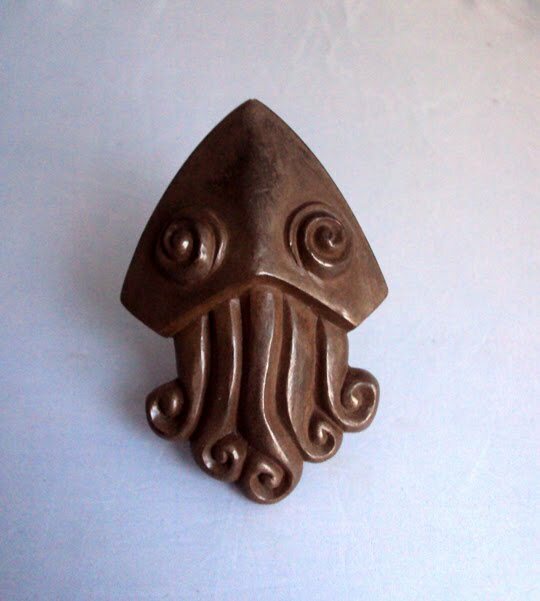 That said, the stylistic elements, from the call-backs to the art of the South Pacific to the asymmetrical form, make it an ideal representation of Deep One aesthetics. Vin Kain brings us this excellent recreation of the power fist prop from "Fallout: New Vegas". 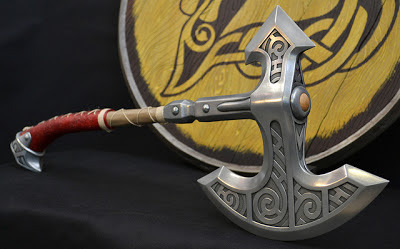 It's interesting how so many artists are tackling video game based props. I would humbly suggest it's because that's where some of the best design work is being done. The final casts of Allan Harwood's ‘Votive of the Deep One’ are now available. The faux bronze finish is quite nice. DaveintheGrave from HalloweenForum brings us this detailed tutorial on creating an animated Ouija board. I know people are intimidated by the idea of creating props with electronic and mechanical components, but this features just a single motor and a relatively simple crank mechanism. And, lets be honest, a planchette scooting across a Ouija board by itself freaks a lot of people out. The Schlitzie from the Replica Prop Forum brings us this mummified Cottingley Fairy corpse. I would strongly suggest reading through the entire thread at the forum, because there are some valuable lessons there. With each iteration of the project he steadily improves the quality of the gaff in both subtle and not so subtle ways every time. It's an excellent demonstration of the cumulative effect of minor improvements (curling the fingers in a death grip, positioning the body, adjusting the temperature used to mold the plastic wrap, etc...) over time. Yordaniella brings us this unusual specimen. 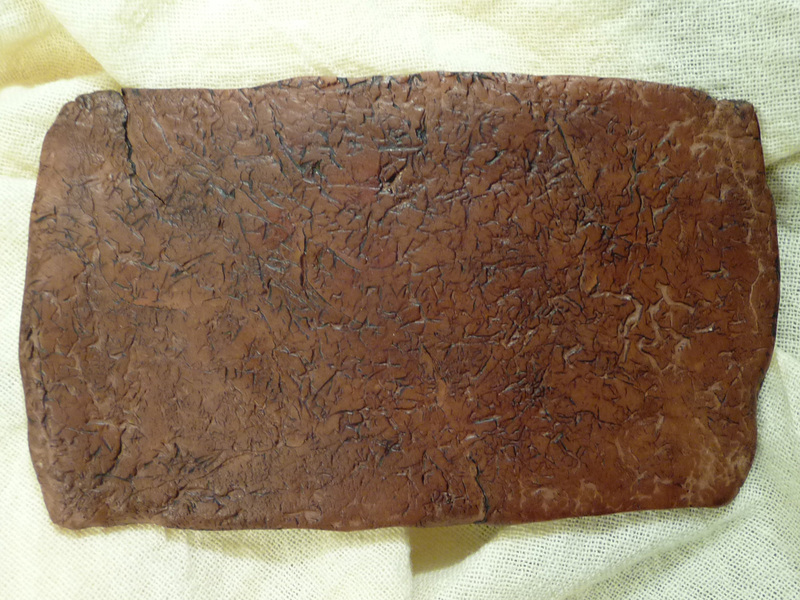 The surface texture almost makes it look like wood, but it's polymer clay over a foil armature. 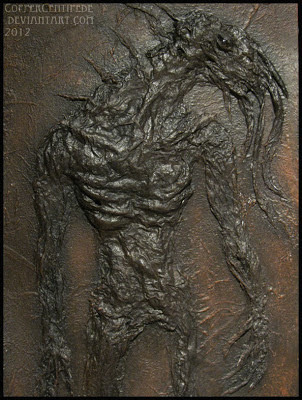 Scavenger Dreggs brings us this very interesting Mythos influenced relief painting. At first I thought it was a faux fossil, but it only draws on some of that imagery. Wesley Remory's long term project to create a detailed tome has two new pages. You can see his earlier efforts over here. 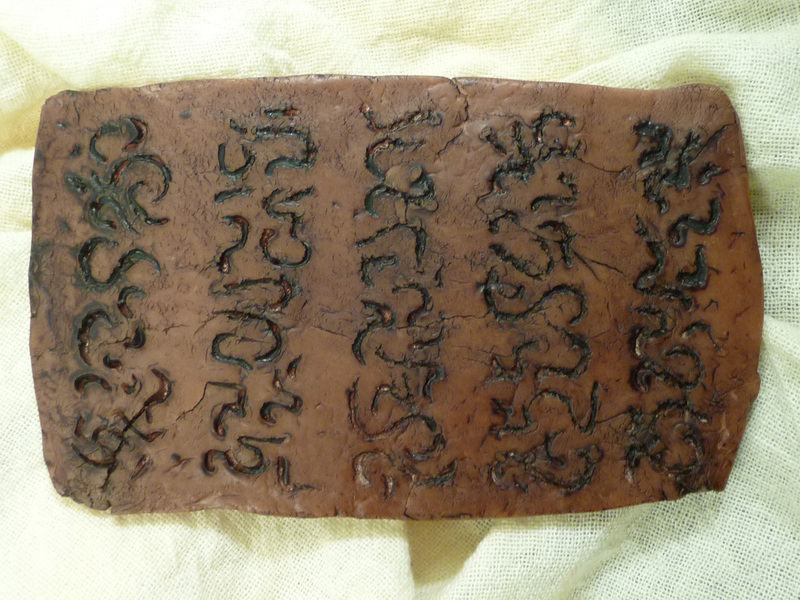 This is a clay tablet that will be part of a Halloween party game. 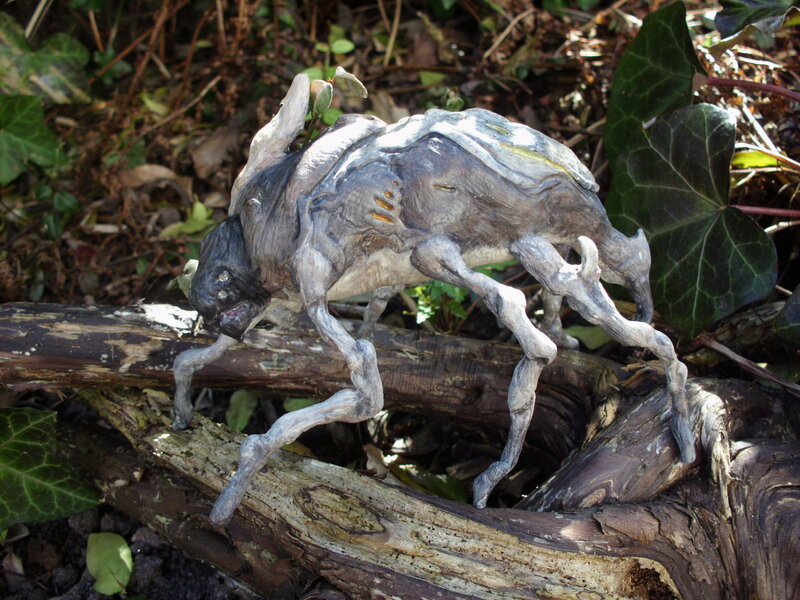 It was sculpted from homemade paper clay, my new favorite material. For something like this it's absolutely ideal. Cheap, easy to work, and tough enough to withstand handling by a horde of kids. I added some pigment powder to give the plain white clay a light brown base color. The lettering was scribed with a stylus and then the whole piece was impressed with a stone from the driveway to give it some texture. I followed that up with a heat gun to force some surface cracking and then let the piece dry. The final finish treatment was a rubdown with wax-based schmutz to dirty it up. The one thing about the final prop that surprised me was it's heft. 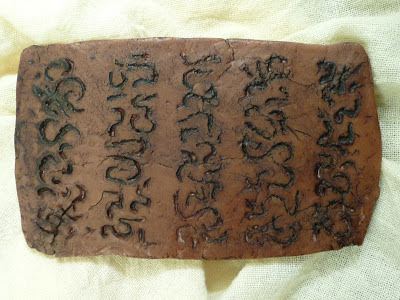 I thought it might come out feeling far too light to pass as mineral clay, but if anything it's heavier than the real stuff. 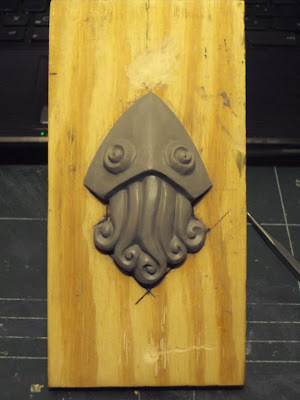 The talented Allan Harwood brings us this work-in-progress shot of his "Votive of the Deep One". 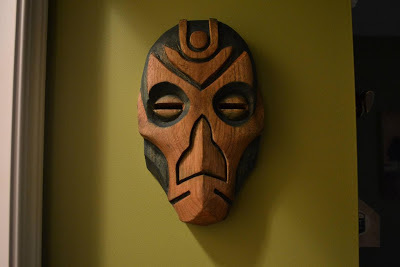 It's based on a design from Mike Mignola's "Hellboy" universe. "Count Zero" at the HauntForum brings us this tutorial for quick and dirty bruises using basic craft paint and a sponge applicator. The end result is almost disturbingly believable. 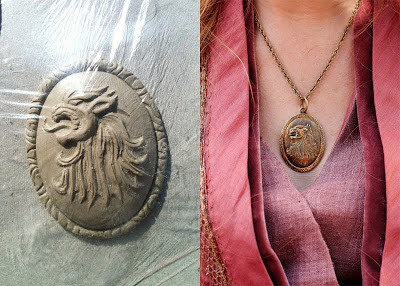 Aaron Rathbun brings us this recreation of Cersei Lannister's pendant from the "Game of Thrones" television series. One nice thing about a popular book series becoming a media property is that it inevitably spawns a variety of props. 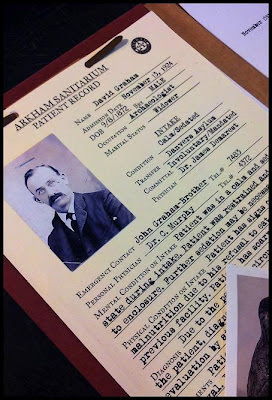 At the same time I was putting together the vintage radio tutorial from earlier this week Jeff Devine just happened to be working on a scenario involving Arkham's first radio station. He was kind enough to send over this business card for it. 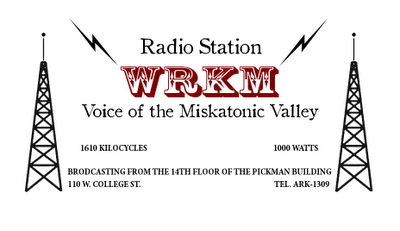 In the real world the WRKM call letters were unassigned until around 1960, when they went to a licensee on 1350 AM in Carthage, Tennessee. After getting an extension on their tower construction permit they appear to have gone on the air in 1963. 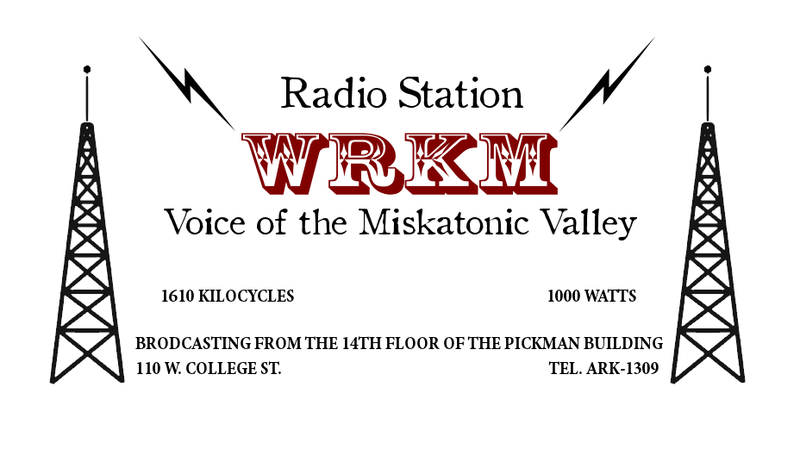 That would suggest the owners of the Arkham station either went out of business or asked for new call letters sometime before that period. "JayDogSqueezy" from Reddit brings us this hand carved Dragon Priest mask from Skyrim. The blank was a block of laminated walnut. Follow the link for a full build log of the process. 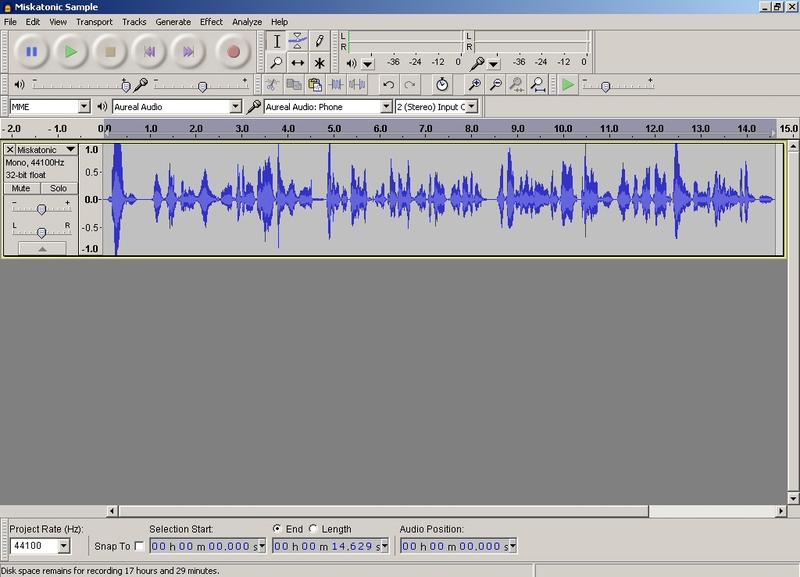 Audacity is a free sound editing program that's ideal for recording and editing clips for game use. It's surprisingly powerful, but easy enough to use that you can have finished audio just minutes after installing it. This is a quick and hopefully easy tutorial on recreating the tinny sound of a vintage radio using the program's standard settings. 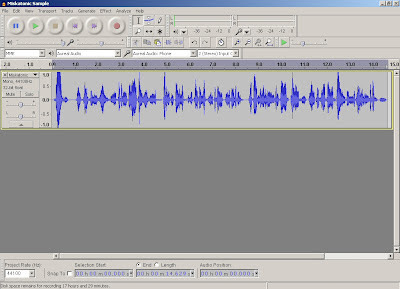 For purposes of the demonstration I'm assuming that you're running the latest version of Audacity (v 2.0.2) on a Windows machine, have a microphone connected to your computer's sound input, and have a basic familiarity with recording audio . First, you'll need to have some narration to work with. 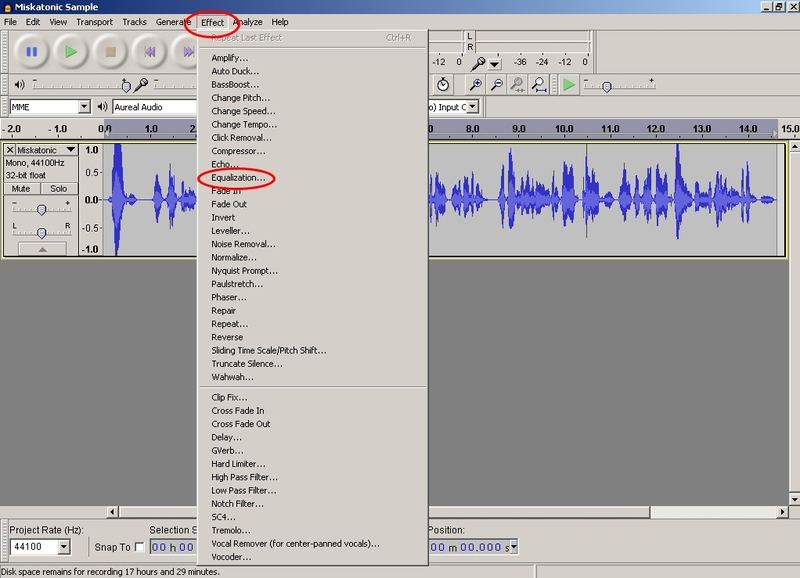 If you're new to the program remember that recording is as easy as clicking the "Record" button, the one marked with a red circle, in the Transport Toolbar. You'll find it in the upper left-hand side of the screen. One thing I wanted to mention is that you shouldn't get hung up on audio quality at this stage. A simple headset or chat microphone is fine for this kind of thing. Once you're done recording your screen should look like this. That squiggly blue line is your waveform, a representation of the sound you just recorded. I've recorded mine in mono, but yours may be set for stereo by default. In that case your waveform will have a left and right channel. For our purposes it doesn't really make a difference. Now we need to recreate the tinny sound of a vintage radio. We'll do this by removing the low-end and high-end frequencies from the audio you just recorded using Audacity's "Equalization" function. 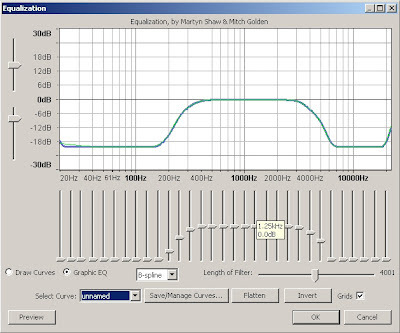 Just click on "Effect" in your upper screen and then select "Equalization". It's the tenth entry down in the menu. Click "Preview" to hear what your audio will sound like once the effect is applied. Notice how it sounds much flatter? It's not quite where we want it, but it's almost there. Click "OK" to apply the effect. Now we're going to do the same thing, except this time we're going to apply the "Telephone" filter from the "Select Curve" menu. Your "Equalization" screen should look something like this. Preview the effect if you'd like and then click "OK" to apply it. Ta-da! We're done. You can playback the finished audio by clicking "Play", the button with the green triangle, in the Transport Toolbar. 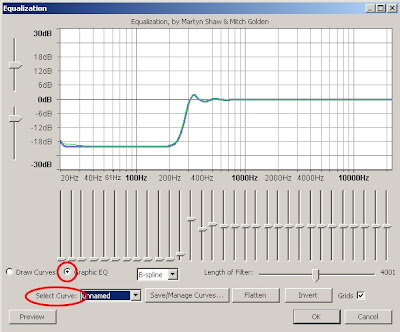 In essence we've used Audacity's pre-set equalization curves to first remove the low end of our audio and then remove most of the high end. The result is a flat, tinny sounding effect that does a serviceable job of reproducing the sound coming out of a vintage radio. You could do exactly the same thing in a single pass by adjusting the settings for each frequency range in the "Equalization" effect screen, but I wanted to stick to using the presets so beginners can get their feet wet. Here's a clip of what the effect should sound like. The first part is my original narration, the second half is the same audio with effects applied. If the embedded player is wiggy you can hear the clip over here at SoundCloud. 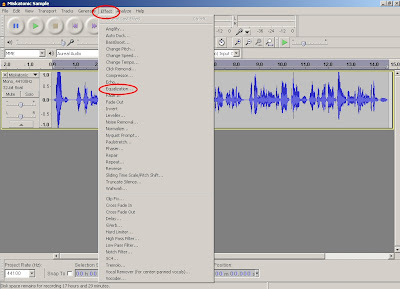 You can save your finished audio file by selecting File>Export from the upper edge of your screen. Because Audacity is open-source it doesn't come with a default option to save your files as an MP3, but standard WAV format should be fine for most purposes. You can save your work as an MP3, but you'll need to install the LAME encoder to do it. 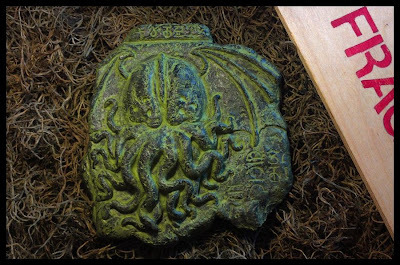 Jason McKittrick returns once again with his Esquimaux Cthulhu fetish from "The Call of Cthulhu". The sculpt does a great job of recreating the look of a fragment from a larger piece. 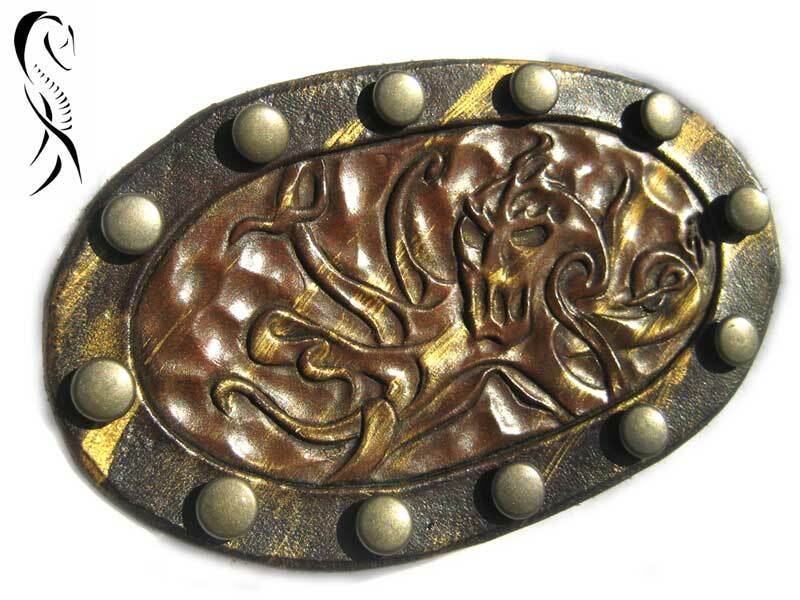 Aaron Rathbun brings us this tooled leather Badge of Leviathan. 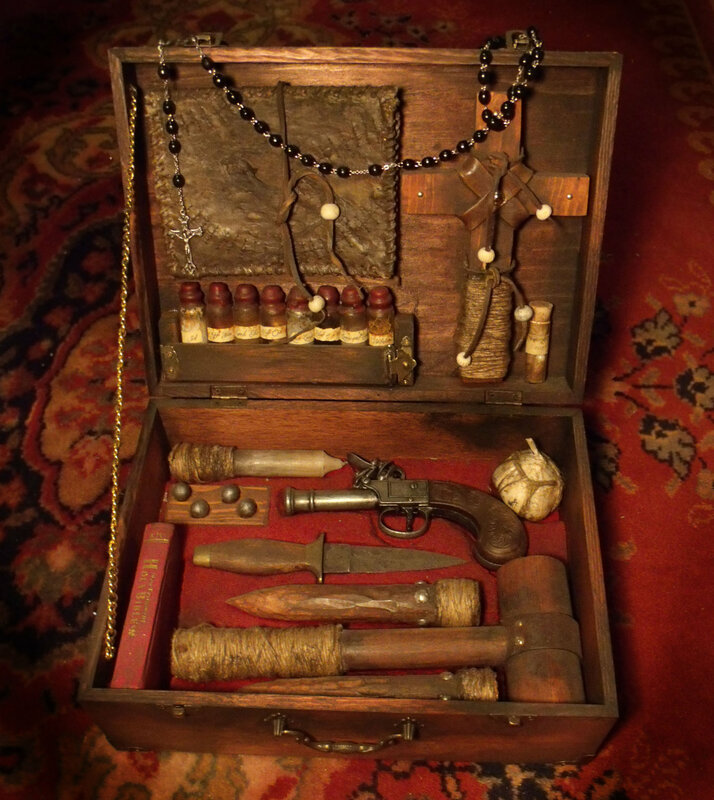 Derek Hayes brings us this vampire killing kit. The only feature I'm not crazy about is the lack of restraints for the contents, particularly with a percussion firearm inside the case. 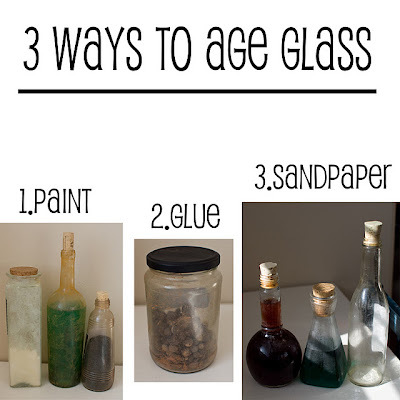 Lisa Proud brings us this tutorial on aging glass jars. It's aimed at Martha Stewart-style crafters creating home decorations, but it's a good overview for prop use as well. The one caveat I would give is the use of sandpaper. I'm sure it's perfectly safe for display-only static props, but I would be leery of using it on items that will be handled regularly. Admittedly, I'm being overly cautious. I had a distressed bottle like that shatter when I simply picked it up from a shelf and set it on a table. I still have numbness in the tip of my index finger from the deep cut that resulted. I'm really not a jerk. I say that in response to a few emails I've received questioning my commitment to the "Lovecraft community". These missives are usually in response to two of my personal quirks. The first is my general dislike for anything in the "Cute-thulhu" category. As I've said before, I have nothing against folks that make or enjoy that sort of thing, but it's not my cup of tea. It only shows up here in the annual April Fools Day post. There are plenty of places that absolutely adore those projects and they almost always get more mainstream attention than the more serious items I enjoy. Despite that, I'm regularly contacted by people that are genuinely upset I'm not featuring their Cthulhu drink coasters or knitted Cthulhu caps. The second is the relative lack of involvement I have with social media. That comes from the fact that I hate to waste time, both my own and others. 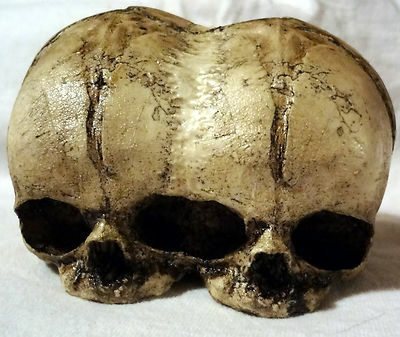 People come here if they're interested in horror props or Mythos goodies. That's it. That's all Propnomicon is about. You want your daily fix? I got ya covered. It's a niche interest, but I do my best to make sure it's served. Personally, I like that kind of approach in other sites. I visit, get the information or entertainment I want, and leave. It keeps what little free time I have uncluttered by needless distractions. I follow the same approach here. The tight focus is because I don't want to waste your precious time. 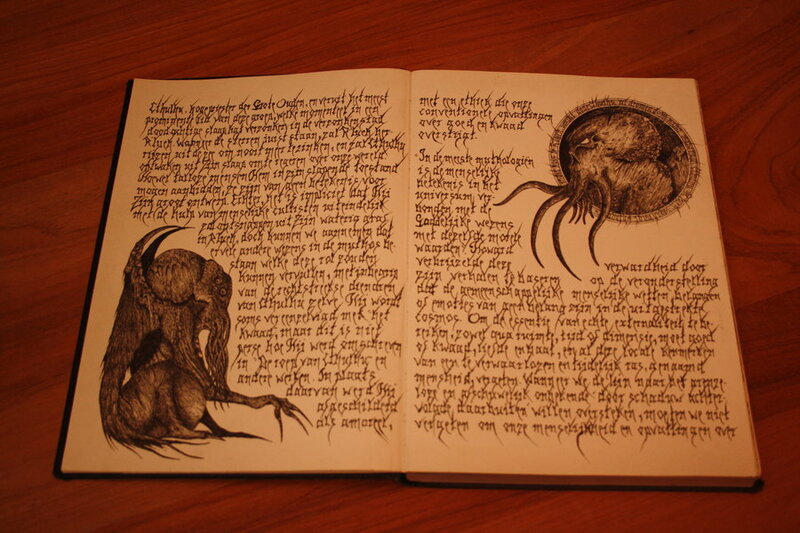 You're here for the tentacles and pentacles! Why would you care about what restaurant I'm eating at? Or what political candidate I support? By the same token, I only follow websites and Twitter denizens that have the same interests. That's not a reflection of anything more than my lack of free time. It's certainly not a comment on anyone's value as a person or artist. I know that my approach can seem brusque or anti-social and for that I sincerely apologize. It's one forced on me by the simple fact that there are only so many hours in the day. As much as I enjoy what I do here, and rest assured it gives me a great deal of pleasure doing it, my other commitments demand the majority of my time. 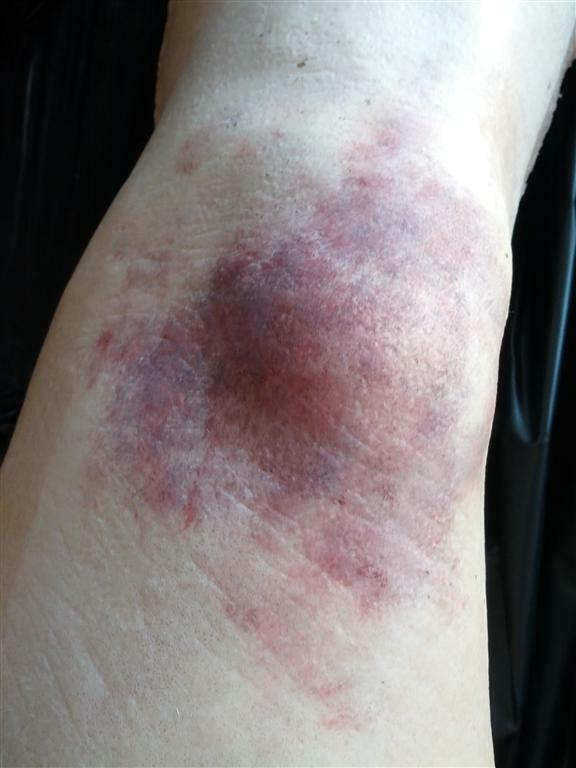 Update: I wanted to thank everyone for their kind words and comments. They're very appreciated. 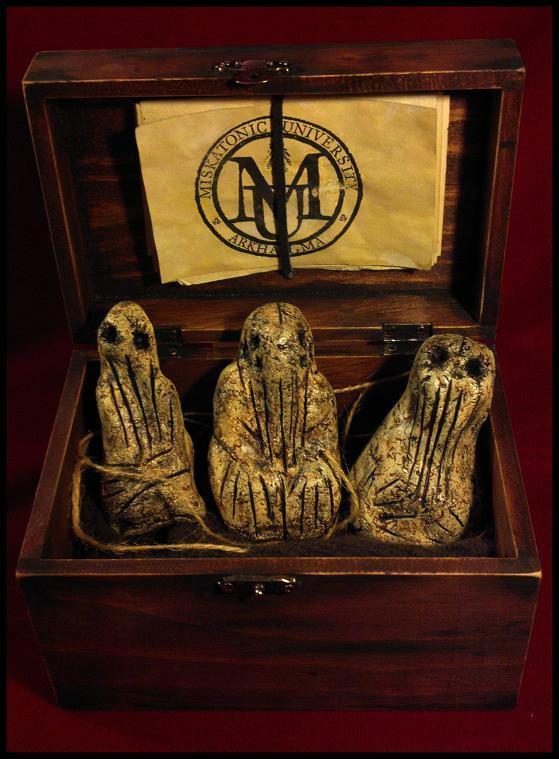 The talented Jason McKittrick brings us this outstanding trio of paleolithic Cthulhu idols. The collection of statuettes gets kicked up to another level thanks to the extensive accessories, including photographs, research notes, and a patient file from Arkham Sanitarium. Just click through for high resolution versions of the pictures. 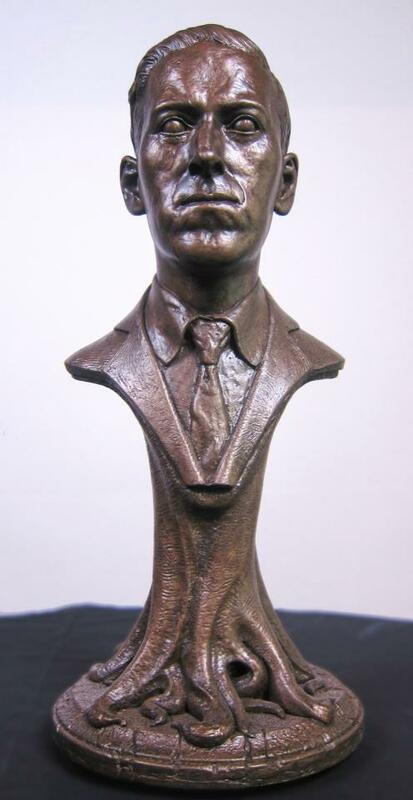 Mr. McKittrick's work is currently available on Ebay. 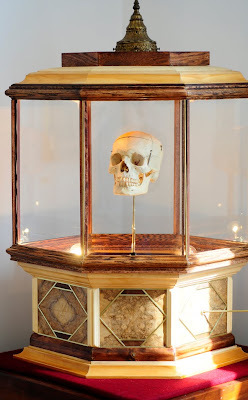 Artist Mike Krohn brings us this curious anatomical artifact. The detail of the sculpt is quite nice, particularly the sutures and anterior fontanelle. 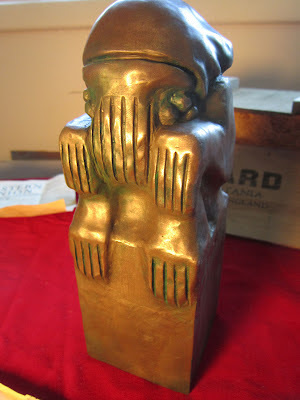 Artist Colin "Wily" Bolton brings us this stylized Cthulhu idol and accompanying materials. 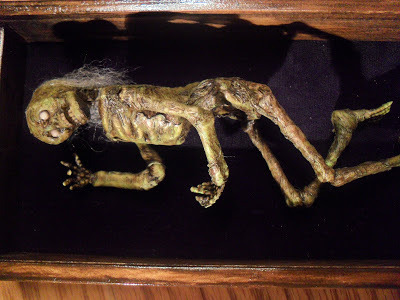 "In the early 1900s an explorer by the name of Colonel Percy Fawcett was well known for seeking strange places. During the Colonel’s last voyage to America he packaged this idol into a box and addressed it to Doctor Schneider at the University of Vermont. 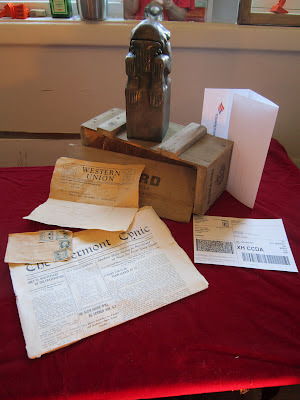 A Western Union telegram was sent first, followed by the box. 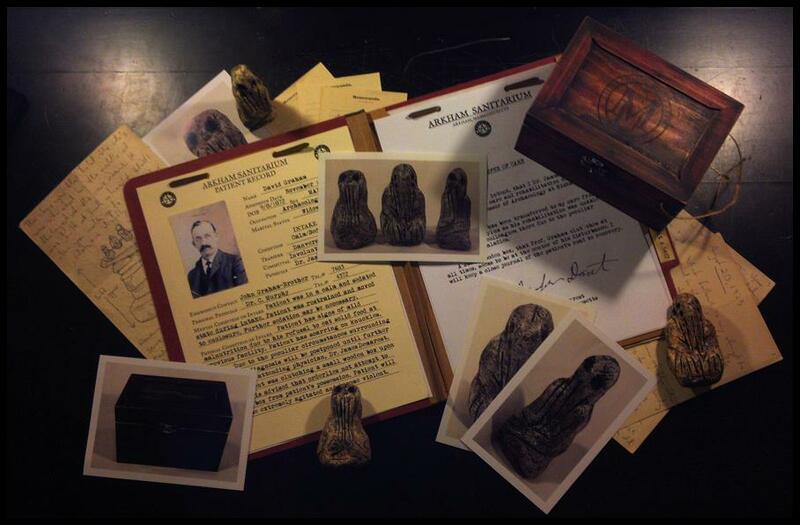 Unfortunately Col. Fawcett never returned from his trip while searching for the Lost City of Z, and so this box sat unopened in a safety deposit box at the Bank of America.